When Renae Allen – quilter, author, teacher, and BERNINA National Artisan – needed a new sewing cabinet, she went straight to the source! When I pulled the new BERNINA 820 out of the box I discovered it was too big for my sewing table opening and too heavy to be safe on a folding table. That’s when I went looking for cabinets! I checked out the place I bought my first cabinet 30+ years earlier and discovered new ownership and wonderful new products. Recently Chris Calloway, owner and CEO of Fashion Sewing Cabinets of America, took me on a tour of their state-of-the-art facility where cabinets and tables are built. 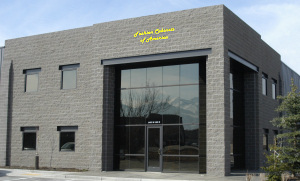 Their product lines are beautiful, innovative, excellent quality, and made in the USA – Orem, Utah to be exact! As sewing machines have evolved with new technology and consumer preferences, so have sewing cabinets and tables. There needs to be something for everyone and sometimes wants and needs change with time, means, and skills. My first cabinet worked great until I started machine quilting and I needed more table surface to support the weight of the quilt. Since I had a dedicated sewing space then I purchased a large sewing table with a drop leaf on the back for quilting. The BERNINA 820 changed the game again. This time I needed the larger opening and drop leaf but I also wanted storage space and a surface area to right of my machine. The 7010 fulfilled my wish list, plus some bonus features such as the electric lift and beautiful wood. Let’s explore some sewing cabinet questions and options before our picture tour of the Fashion Sewing Cabinets facility. Why do I choose to put my sewing machines in a cabinet and/or table? Because a sewing cabinet or table . . . Defines a sewing space where I can work, leave, and return. Allows the sewing machine to be stored where it is used. Protects the sewing machine – especially if I lower it into the cabinet which I usually did when I had small children at home and before I had a sewing room. Is designed for the work I am trying to do. The kitchen table doesn’t make the best desk or sewing table. Makes a comfortable height for sewing and quilting because the machine sits lower in the cabinet. Provides a sturdy and stable sewing surface which is important when I am free motion quilting at full throttle. Provides a good work area when a leaf folds out or lifts up. Provides convenient and handy storage with drawers, trays, or bins. Isn’t a cabinet or table expensive? There are tables and cabinets for all budgets from the economy folding table (MFSR $239.00) to the premium solid wood cabinets (MFSR $1,300 – $2,900) with many options in between. A sewing machine is a big investment and a cabinet helps protect that investment. A modular collection allows purchasing a table and then adding drawer caddies and additional pieces such as a serger table when the budget allows. Cabinets are an investment to be used for many years and often outlast every other piece of furniture in the home. I used my first cabinet for 23 years. Don’t cabinets take up a lot of space? Cabinets and tables range in size so they can fit in small or large spaces. My daughter-in-law has her 299 sewing table at the foot of their bed in their small student apartment. Cabinets can have maximum storage and a large work area, maximum storage and a limited work area, or limited work area and storage for limited space. Some cabinets have space saving features such as bi-fold and pocket doors or a drop leaf on the back of the cabinet which can be lifted up when the cabinet is pulled away from the wall. What are some different features which are available on cabinets? Electric lift to raise and lower the machine. Drop leaf for additional area when quilting. Drawers, trays, bins, and even a small ironing board. Serger door which converts to a serger table when it is opened. Laminate or clear acrylic inserts which are cut for specific machines so the cabinet can be used even when the machine changes. What if I have an oversized machine like the BERNINA 830 or 820? No problem! Cabinets are now available for the new larger machines. Sturdy cabinets are wonderful for oversized machines. What are some alternatives to sewing tables and cabinets? Purchase or make an extension table for a workable alternative to a table or cabinet. It is a minimum requirement for free-motion machine quilting. 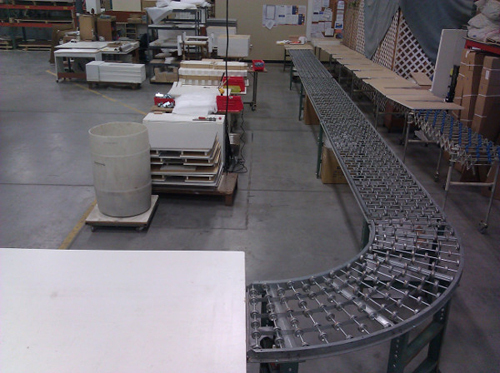 A good choice is a clear acrylic table which is made specifically for a machine to provide a larger surface work area. The manufacturer suggested retail price is about $95.00 depending on the size. A disadvantage of an extension table is that it is higher and less comfortable. That can be fixed by raising the height of the chair or table. An advantage of purchasing an extension table is that it is portable. I bought one to take with my little activa 145 when I teach machine quilting classes. Purchase a large table with adjustable legs. Use an old door with a filing cabinet on each end to hold it. There is always the kitchen or dining room table . . . .
How do I purchase a cabinet, table, or extension table from Fashion Cabinets of America? Go to http://www.fashionsewingcabinets.com and click on dealers to find a dealer near you. The dealer may assemble the cabinet or may have it drop shipped to your home. Don’t panic if some assembly is required. I have put together several tables and cabinets. The instructions are clear and it requires minimum tools and effort. Fashion Sewing Cabinets has been designing, manufacturing and selling fine sewing and craft furniture for over 53 years. Their production facilities are located about 40 miles south of Salt Lake City in Orem, Utah which just happens to be where I grew up. 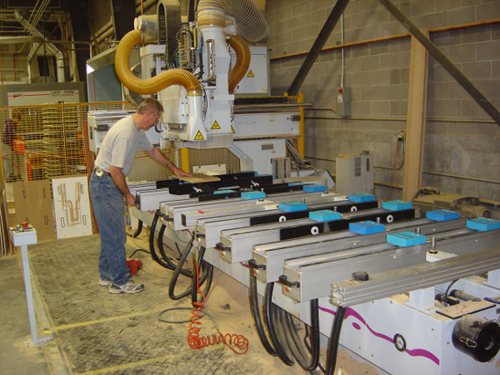 CNC 1 Router – The cabinets start at this CNC 1 (Computer Numerical Control) router which cuts cabinets from large sheets of material. CNC 2 Machine – This CNC 2 machine is more for the odd size pieces and does operations such as boring holes in the edges of pieces cut on CNC 1, and also cuts all of the inserts. Vacuum Press – Pieces with waterfall edges, rounded parts or designs are sprayed with a heat-activated glue and laid out on the press. 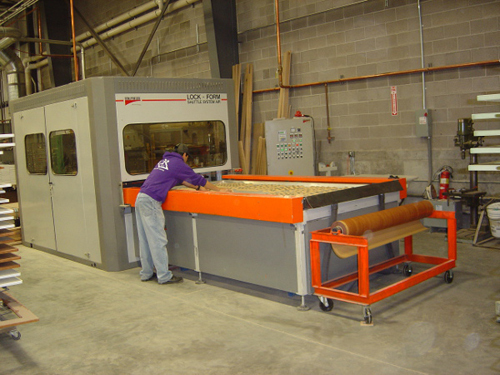 A sheet of lamination plastic is laid on top and the bed moves into the machine for heating and vacuum-forming to the shapes. 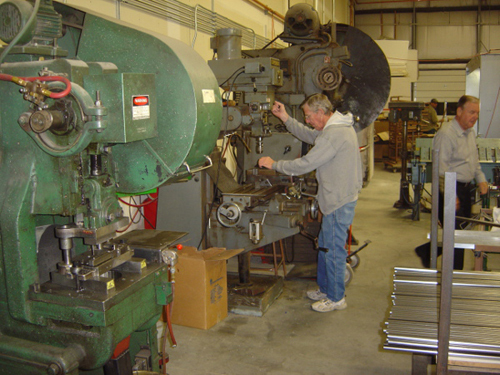 Metal Shop – Nearly every metal part is made in Fashion Cabinet’s metal shop. From small brackets to the electric lift, they stamp, press, cut, chop, weld and powder coat their parts here. Some pieces are pre-cut by laser off site. 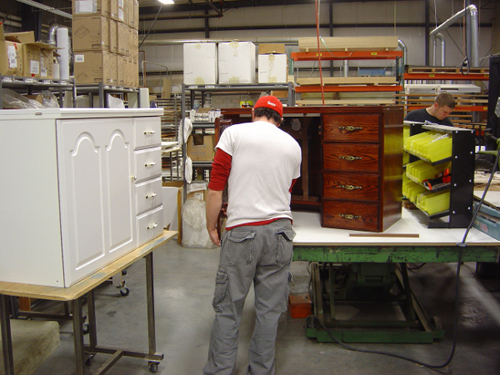 Assembly 1 – Larger cabinets are assembled by master assemblers. Meticulous and painstaking, they put their hearts into every cabinet. The white cabinet doors were made on the vacuum press while the solid wood cabinet was stained and finished in the wood shop. Assembly 2 – Smaller cabinets and tables are assembled in this area. 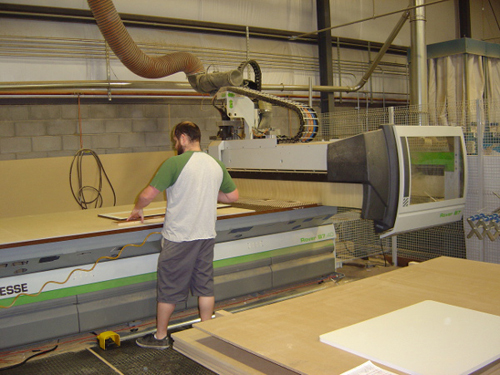 In addition to producing their own product lines, Fashion Sewing Cabinets also does some mass production of tables and cabinets for other companies. Finally the products are boxed and prepared for shipping. Eventually they end up providing a home for our sewing machines! Fantastic article and how apropos, as I’m in the process of making my spare bedroom into a dedicated sewing room. Thanks!